List of Philadelphia hotels that sleep families of 5-6 in one guestroom. Scroll down for a list of Philadelphia hotels that accommodate five (5) or six (6) in one family room. The price/rate range of each hotel is indicated by the “$” sign. See the $-symbol key in the sidebar. Click on the hotel name for more details. This list includes larger hotel rooms, hostels and suites for budgets from affordable to luxury. All guestrooms have private bathrooms unless otherwise mentioned. 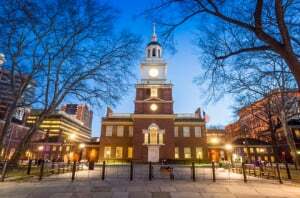 Check out the official Philadelphia Visitor Website “Visit Philly” for information about things to do and places to see in the City of Brotherly Love. For Americans (USA), this city has special significance as one of the birth places of our independent nation.